The release of a new Raden model to follow-up on last year’s Sunrise has been expected but specific details have been lacking. That changed this evening when De Roos gave us a glimpse of a new Raden model from Pelikan via their Instagram page. De Roos is a fountain pen retailer based in Heemstede, Netherlands and has been around since 1953. The pen featured today is the upcoming M800 Royal Gold. It appears that De Roos is the first to break this news. This would be the first Raden release in the M8xx form factor since the Kyokko & Gekko of 2005. It will join the likes of the Kyokko & Gekko (2005), Moonlight (2011), Sunlight (2013), Starlight (2014), and Sunrise (2016). For those unfamiliar with Raden, it is a traditional Japanese decorative craft characterized by finely ground abalone embedded or glued onto laquer-coated surfaces. The inlay glitters in wonderful colors when struck by light. The painstaking process ensures that these are usually limited in number and quite expensive at retail. Based on the available photo, the Royal Gold will have the standard gold-plated M800 furniture including two trim rings at the piston knob, two trim rings on the cap, and a single trim ring on the section. The cap top is done in 24 karat gold plate and depicts Pelikan’s single chick logo. The standard pelicans beak cap clip completes the cap’s appearance. The piston knob and section are done in black resin with a very dark grey ink-view window sitting just above the section’s cap threads. The Royal Gold will come equipped with a two-toned 18C-750 gold nib. Prior Raden releases, such as last year’s Sunrise, were only available with a medium sized nib so you can likely expect the same here. What really distinguishes the Royal Gold is the pattern on the barrel and cap. Alternating between verticals of black resin, we see stripes of gold hued Raden which really comes together to create a stunning visual effect. There is definitely a warmth and a richness here that I hope comes through equally as well in real life as it does in the product shots. 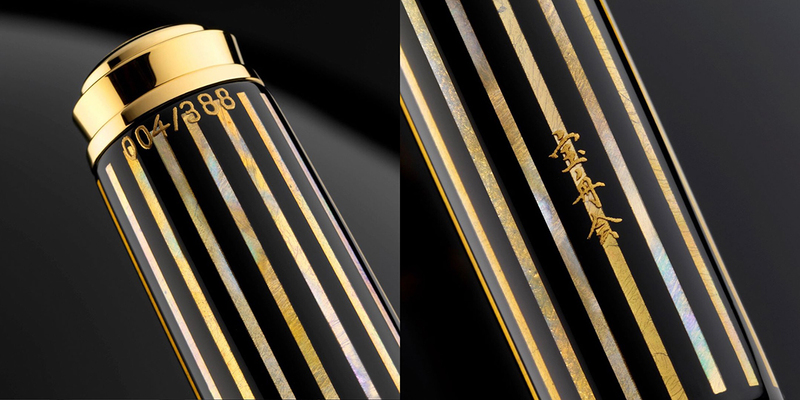 The gold effect has been achieved by affixing 24 carat gold foil as a background on the mother of pearl stripes. Each pen is signed and numbered using traditional Maki-e techniques and will come in a traditional Japanese gift box which is made of Paulownia wood. The Royal Gold will be limited to just 388 pieces, a fairly standard run for Pelikan’s Raden releases. For comparison, last year’s Sunrise came in at 333 pieces. I’d expect to find this somewhere in the neighborhood of $1500-$2000 at retail based on prior models and where you live. Some overseas vendors are asking €1785 (with VAT) which punches at the top end of that range. I have seen a price of €1475.21 quoted from an overseas vendor for those of us who live in the US. That would be roughly $1607.60. A release date of sometime in June 2017 is anticipated. Left: Cap top depicting the limited edition number. Right: The artist’s signature on the barrel of the pen. I thought that the M1000 Raden Sunrise from 2016 was the best looking Raden that I had personally seen up to that point. After getting a view of the Royal Gold, that opinion is clearly called into question. Serves me right for thinking Pelikan couldn’t best themselves. The company continues to impress with the artistry and design of their releases and I imagine this one will be an easy sell for those who can afford such a luxury item. What are your thoughts on the M800 Royal Gold? M800 Raden Kyokko & Gekko Set (2005). This was the last Raden release based off of the M800 chassis. Only 200 were made. UPDATE 5/1/17: Post updated to reflect additional information and includes additional product photos. That is a very handsome pen. If I didn’t just get the red m800 a couple of weeks ago I’d be ready to order one. I think it is much better looking than the earlier two, honestly. Congrats on the red M800. They are getting harder and harder to find, especially for reasonable prices. I agree that the Royal Gold looks much better than prior Radens. Thanks. Regina Martini had it for about $600 US. That worked for me. 😊 I think Caran d’ache ultra violet will feel at home there. That’s not a bad deal given their scarcity. Very nice. I like the colors they have chosen for this one–they are much warmer than the usual blue/green raden palette. I totally agree. It’s the warmth of it that really gets me. Before my eyes adjusted to the shock, I though that I was looking at a P3110 Ductus which also had gold striping. Just take my money. How’s that. Pelikan really knows how to make your wallet bleed. 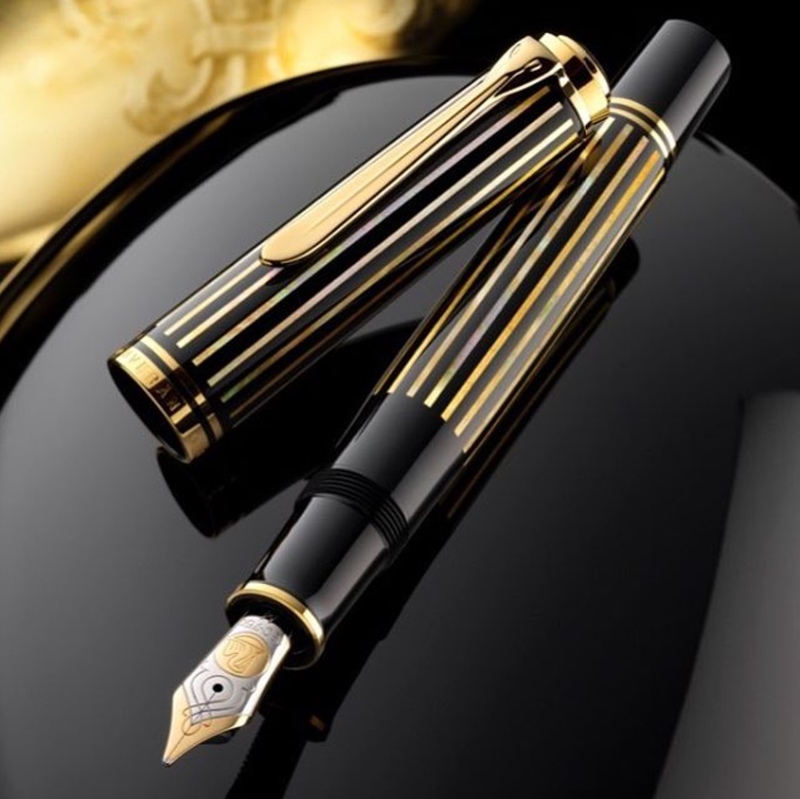 I was really hoping that it would be an M1000 as the next Pelikan raden, but this is stunning! Fighting the need to get this, but that is probably a losing fight! I think that they’ll probably move more quickly off the shelves with this one being in the M800 form factor. This is going to be a very tough pen to resist, especially if it’s as eye catching in person. I agree that it’s hard to justify if it’s just going to sit in the box. That’s why I strive to use them all, no matter the price point but it’s certainly more difficult to ink a $1000+ pen. Ha! I love the analogy. It paints a perfect picture. I totally respect your opinion. That’s one of the beauties of the brand. The next release is just around the corner and likely to be just what you’re looking for. This pen is simply outstanding. The gold-matching abalone is simply perfect, classy but not flashy. The price is out of reach at the moment for me (and possibly also in the future given the small number produced) but it’s the first time a see a usable new pen priced >1500€ be worth the money. I think these are likely to be quite pricey on the secondary market once the initial run is sold. I agree though that this is one of the better looking, functional high end pens out there. Have one on pre-order and look forward to its release.